Now that they’ve finally started drafting, the picks are coming hot and heavy.Â With the 11th pick in the third round, the Cowboys took Robert Brewster, who played offensive tackle at Ball State but is expected to move to guard in the NFL. Goose Gosselin ranked him 81st, so another pick where the Cowboys didn’t take the best available player. Pick Analysis: The Cowboys pick up a hulking interior prospect with the selection of Brewster. Though he spent his college career as an offensive tackle, Brewster will likely move inside to guard for the Cowboys. Ball State’s national ranking in 2008 was the first in school history. With Brewster providing stellar blocking in the trenches, the Cardinals scored 33 of 48 times in the red zone, including 27 touchdowns and six field goals. Brewster had 13 touchdown-resulting blocks through 14 games. That performance by Brewster earned him consideration for the Lombardi and Outland trophy, given to the best interior lineman in college football. At Wyoming High School, Brewster lettered three times in football and also competed for the basketball team. He was named the Cincinnati Hills League Offensive Player of the Year as a senior, leading the team to a 7-3 record. He also garnered All-State, All-City and “Tremendous 26″ Division III Player of the Year accolades. The team would compile a 34-11 record during his prep playing days. As a true freshman, Brewster immediately earned a starting job. He lined up at right offensive tackle for the first four games, shifting to right guard for the final seven contests. He provided solid pass protection as quarterback Joey Lynch set a school season-record with 18 touchdown tosses. The lineman would go on to post 65 knockdown blocks, helping the Cardinals average 299.0 yards per game. Ball State allowed 43 quarterback sacks in 2005 and Brewster graded 82.7% for blocking consistency, delivering nine touchdown-resulting blocks. His play up front saw the Cardinals reduce their sacks allowed total to 28, as the offense gained 4,215 yards, an average of 351.2 yards per game. Brewster continued his dominance in 2007. He was a first-team All-Mid-American Conference pick, collected 105 knockdowns and 13 touchdown-resulting blocks in 13 games. The team averaged 433.8 yards per game, including 284.9 yards via their aerial attack, finishing the year with an 82.54% grade. Brewster earned All-American midseason honors from Sports Illustrated and was a unanimous All-MAC first-team choice in 2008. He allowed just 2.5 quarterback sacks on 405 pass plays and led the conference down linemen with 100 knockdowns, while ranking second in the league with 14 touchdown-resulting blocks. Attended Wyoming (Cincinnati, Oh.) High School, playing football for head coach Bernie Barre…Lettered three times in football and also competed for the basketball team…Was named the Cincinnati Hills League Offensive Player of the Year as a senior, leading the team to a 7-3 record…Also garnered All-State, All-City and “Tremendous 26″ Division III Player of the Year accolades…The team would compile a 34-11 record during his prep playing days. Positives: Good initial quickness off the snap, lateral agility and flexibility for the cut block. Can get out and run to make blocks at the second level. Good initial pop. Can turn the defender and seal. Flashes some nastiness and looks to finish his opponent when he feels vulnerability. Bends naturally at the knees and eases out of his stance fluidly with the balance to mirror defenders. Negatives: Operates out of the spread and is rarely asked to block out of a three-point stance. Inconsistent hand punch. Only marginal hand quickness. Will allow his hands to get outside the chest-plate when run blocking. Lacks the strength to consistently sustain. Scouts, Inc. gives him very mixed reviews and a grade of 52. Production 1 Brewster started all 11 games during his true freshman season in 2005. He lined up at right tackle during the first four games and then moved to right guard for the final seven games. 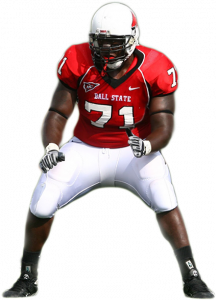 2006-’08: Brewster makes 39 consecutive starts at right tackle and earns first team All-Mac selections in 2007 and 2008. Height-Weight-Speed 2 Adequate height, adequate top-end speed and above-average bulk. Durability 1 Started all 50 games of four-year collegiate career. Character 2 Known as a self-starter. Majors in criminal justice. Strength/Toughness 4 Showed adequate upper body strength at the Combine but it doesn’t show up on film enough. Doesn’t jar defenders with a violent initial punch and though blocks from the snap until the whistle needs to be more aggressive at times. Agility 2 Quick, moves well and does a nice job of adjusting to moving targets in space. Makes a smooth transition to the second level and shows good lateral quickness. Awareness 2 Shows good pre-snap awareness, quickly recognizes blitzes and gets into sound position to pick up assignment. Does a nice job of staying at home when sees line stunts unfolding and waits for inside rusher to loop around when defensive end shoots inside. Pass Protection 3 Gets set quickly. Light on his feet, maintains balance and does a nice job of shuffling feet. However, he has a tendency to catch pass rushers and needs to develop a stronger initial punch. Doesn’t do a good job of sinking hips and gives too much ground to bull rushers despite size. Run Blocking 3 Gets into sound initial position and uses hands well. Capable of reaching five-techniques and sealing the edge. However, is more of a finesse blocker than a road grader and doesn’t get enough push.